The Cradle of Humankind World Heritage Site near Johannesburg, South Africa has once again produced bones. Previous finds, nearly one third of all ancient hominin fossils found, date to 3.5 million years of age. This new find may be the bones of our ancestor, but regardless, they certainly are the bones of a new, previously unknown, species. The announcement came this week and articles can be seen online in several locations. The National Geographic Society is a partner in the excavation and retrieval of the bones from a very difficult cave, Rising Star, through only a very small opening following a precipitous decline. Stated bluntly – this is a “scare the hell out of you” cave. Not exactly convenient or inviting. There was more than one skeleton present. In this article and video from the New York Times, you can see that many bones were recovered, quite obviously from multiple individuals. More than 1550 in total – representing at least 15 different individuals. How did they get in this extremely remote cave with very limited access in the first place? And why? Is this a separate species from ours, or our ancestors? How long ago did they live, and where do they fit on the family tree? The scientists are now referring to the ancient family tree as a braided stream – a river that divides into channels only to converge again later. These announcements are being followed by a special on Nova/National Geographic Special titled the “Dawn of Humanity” which premieres on Sept. 16, 2015 at 9 PM ET/8 Central on PBS and is streaming online now. This documentary details the discovery and excavation of the fossils in the cave including Homo Naledi. In the mean time, take a look at this wonderful article, chock full of pictures of course, by National Geographic. If you subscribe to the National Geographic magazine, guess what will be on the cover of the October issue??? This article in New Scientist has a great reconstruction of the Homo Naledi skull, and states that no attempt has yet been made to extract DNA. I continue to remind myself that patience is a virtue. It’s that time again, to look over the year that has just passed and take stock of what has happened in the genetic genealogy world. I wrote a review in both 2012 and 2013 as well. Looking back, these momentous happenings seem quite “old hat” now. For example, both www.GedMatch.com and www.DNAGedcom.com, once new, have become indispensable tools that we take for granted. Please keep in mind that both of these tools (as well as others in the Tools section, below) depend on contributions, although GedMatch now has a tier 1 subscription offering for $10 per month as well. So what was the big news in 2014? Genetic genealogy has gone over the tipping point. Genetic genealogy is now, unquestionably, mainstream and lots of people are taking part. From the best I can figure, there are now approaching or have surpassed three million tests or test records, although certainly some of those are duplicates. The organizations above represent “one-test” companies. Family Tree DNA provides various kinds of genetic genealogy tests to the community and they have over 380,000 individuals with more than 700,000 test records. In addition to the above mentioned mainstream firms, there are other companies that provide niche testing, often in addition to Family Tree DNA Y results. In addition, there is what I would refer to as a secondary market for testing as well which certainly attracts people who are not necessarily genetic genealogists but who happen across their corporate information and decide the test looks interesting. There is no way of knowing how many of those tests exist. Additionally, there is still the Sorenson data base with Y and mtDNA tests which reportedly exceeded their 100,000 goal. Spencer Wells spoke about the “viral spread threshold” in his talk in Houston at the International Genetic Genealogy Conference in October and terms 2013 as the year of infection. I would certainly agree. Another change in the landscape is that now, autosomal DNA has become the “normal” test. The big attraction to autosomal testing is that anyone can play and you get lots of matches. Earlier in the year, one of my cousins was very disappointed in her brother’s Y DNA test because he only had a few matches, and couldn’t understand why anyone would test the Y instead of autosomal where you get lots and lots of matches. Of course, she didn’t understand the difference in the tests or the goals of the tests – but I think as more and more people enter the playground – percentagewise – fewer and fewer do understand the differences. Case in point is that someone contacted me about DNA and genealogy. I asked them which tests they had taken and where and their answer was “the regular one.” With a little more probing, I discovered that they took Ancestry’s autosomal test and had no clue there were any other types of tests available, what they could tell him about his ancestors or genetic history or that there were other vendors and pools to swim in as well. This year has seen many ancient DNA specimens analyzed and sequenced at the full genomic level. The year began with a paper titled, “When Populations Collide” which revealed that contemporary Europeans carry between 1-4% of Neanderthal DNA most often associated with hair and skin color, or keratin. Africans, on the other hand, carry none or very little Neanderthal DNA. A month later, a monumental paper was published that detailed the results of sequencing a 12,500 Clovis child, subsequently named Anzick or referred to as the Anzick Clovis child, in Montana. That child is closely related to Native American people of today. In June, another paper emerged where the authors had analyzed 8000 year old bones from the Fertile Crescent that shed light on the Neolithic area before the expansion from the Fertile Crescent into Europe. These would be the farmers that assimilated with or replaced the hunter-gatherers already living in Europe. Svante Paabo is the scientist who first sequenced the Neanderthal genome. Here is a great interview and speech. This man is so interesting. If you have not read his book, “Neanderthal Man, In Search of Lost Genomes,” I strongly recommend it. In the fall, yet another paper was released that contained extremely interesting information about the peopling and migration of humans across Europe and Asia. This was just before Michael Hammer’s presentation at the Family Tree DNA conference, so I covered the paper along with Michael’s information about European ancestral populations in one article. The take away messages from this are two-fold. First, there was a previously undefined “ghost population” called Ancient North Eurasian (ANE) that is found in the northern portion of Asia that contributed to both Asian populations, including those that would become the Native Americans and European populations as well. Secondarily, the people we thought were in Europe early may not have been, based on the ancient DNA remains we have to date. Of course, that may change when more ancient DNA is fully sequenced which seems to be happening at an ever-increasing rate. If I were to give a Citizen Scientist of the Year award, this year’s award would go unquestionably to Felix Chandrakumar for his work with the ancient genome files and making them accessible to the genetic genealogy world. Felix obtained the full genome files from the scientists involved in full genome analysis of ancient remains, reduced the files to the SNPs utilized by the autosomal testing companies in the genetic genealogy community, and has made them available at GedMatch. If this topic is of interest to you, I encourage you to visit his blog and read his many posts over the past several months. The availability of these ancient results set off a sea of comparisons. Many people with Native heritage matched Anzick’s file at some level, and many who are heavily Native American, particularly from Central and South America where there is less admixture match Anzick at what would statistically be considered within a genealogical timeframe. Clearly, this isn’t possible, but it does speak to how endogamous populations affect DNA, even across thousands of years. Because Anzick is matching so heavily with the Mexican, Central and South American populations, it gives us the opportunity to extract mitochondrial DNA haplogroups from the matches that either are or may be Native, if they have not been recorded before. Needless to say, the matches of these ancient kits with contemporary people has left many people questioning how to interpret the results. The answer is that we don’t really know yet, but there is a lot of study as well as speculation occurring. In the citizen science community, this is how forward progress is made…eventually. A Siberian sample that also matches the Malta Child whose remains were analyzed in late 2013. Felix has prepared a list of kits that he has processed, along with their GedMatch numbers and other relevant information, like gender, haplogroup(s), age and location of sample. Furthermore, in a collaborative effort with Family Tree DNA, Felix formed an Ancient DNA project and uploaded the ancient autosomal files. This is the first time that consumers can match with Ancient kits within the vendor’s data bases. Recently, GedMatch added a composite Archaic DNA Match comparison tool where your kit number is compared against all of the ancient DNA kits available. The output is a heat map showing which samples you match most closely. Indeed, it has been a banner year for ancient DNA and making additional discoveries about DNA and our ancestors. Thank you Felix. That SNP tsunami that we discussed last year…well, it made landfall this year and it has been storming all year long…in a good way. At least, ultimately, it will be a good thing. If you asked the haplogroup administrators today about that, they would probably be too tired to answer – as they’ve been quite overwhelmed with results. The Big Y testing has been fantastically successful. This is not from a Family Tree DNA perspective, but from a genetic genealogy perspective. Branches have been being added to and sawed off of the haplotree on a daily basis. This forced the renaming of the haplogroups from the old traditional R1b1a2 to R-M269 in 2012. While there was some whimpering then, it would be nothing like the outright wailing now that would be occurring as haplogroup named reached 20 or so digits. Alice Fairhurst discussed the SNP tsunami at the DNA Conference in Houston in October and I’m sure that the pace hasn’t slowed any between now and then. According to Alice, in early 2014, there were 4115 individual SNPs on the ISOGG Tree, and as of the conference, there were 14,238 SNPs, with the 2014 addition total at that time standing at 10,213. That is over 1000 per month or about 35 per day, every day. Yes, indeed, that is the definition of a tsunami. Every one of those additions requires one of a number of volunteers, generally haplogroup project administrators to evaluate the various Big Y results, the SNPs and novel variants included, where they need to be inserted in the tree and if branches need to be rearranged. In some cases, naming request for previously unknown SNPs also need to be submitted. This is all done behind the scenes and it’s not trivial. The project I’m closest to is the R1b L-21 project because my Estes males fall into that group. We’ve tested several, and I’ll be writing an article as soon as the final test is back. The tree has grown unbelievably in this past year just within the L21 group. This project includes over 700 individuals who have taken the Big Y test and shared their results which has defined about 440 branches of the L21 tree. Currently there are almost 800 kits available if you count the ones on order and the 20 or so from another vendor. Compare this with today’s tree, below. Michael Walsh, Richard Stevens, David Stedman need to be commended for their incredible work in the R-L21 project. Other administrators are doing equivalent work in other haplogroup projects as well. I big thank you to everyone. We’d be lost without you! One of the results of this onslaught of information is that there have been fewer and fewer academic papers about haplogroups in the past few years. In essence, by the time a paper can make it through the peer review cycle and into publication, the data in the paper is often already outdated relative to the Y chromosome. Recently a new paper was released about haplogroup C3*. While the data is quite valid, the authors didn’t utilize the new SNP naming nomenclature. Before writing about the topic, I had to translate into SNPese. Fortunately, C3* has been relatively stable. The Family Tree DNA International Conference on Genetic Genealogy for project administrators is always wonderful, but this year was special because it was the 10th annual. And yes, it was my 10th year attending as well. In all these years, I had never had a photo with both Max and Bennett. Everyone is always so busy at the conferences. Getting any 3 people, especially those two, in the same place at the same time takes something just short of a miracle. Ten years ago, it was the first genetic genealogy conference ever held, and was the only place to obtain genetic genealogy education outside of the rootsweb genealogy DNA list, which is still in existence today. Family Tree DNA always has a nice blend of sessions. I always particularly appreciate the scientific sessions because those topics generally aren’t covered elsewhere. Jennifer Zinck wrote great recaps of each session and the ISOGG meeting. I thank Family Tree DNA for sponsoring all 10 conferences and continuing the tradition. It’s really an amazing feat when you consider that 15 years ago, this industry didn’t exist at all and wouldn’t exist today if not for Max and Bennett. 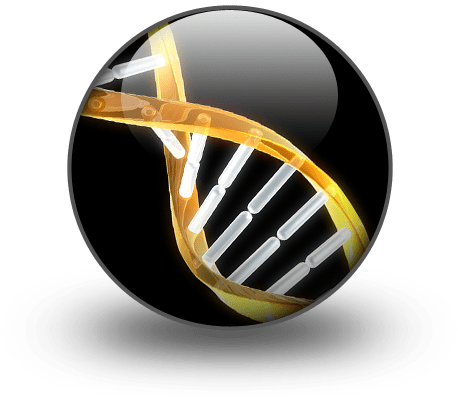 Two educational venues offered classes for genetic genealogists and have made their presentations available either for free or very reasonably. One of the problems with genetic genealogy is that the field is so fast moving that last year’s session, unless it’s the very basics, is probably out of date today. That’s the good news and the bad news. In addition, three books have been released in 2014. In January, Emily Aulicino released Genetic Genealogy, The Basics and Beyond. Most recently, David Dowell’s new book, NextGen Genealogy: The DNA Connection was released right after Thanksgiving. This seems to be the year that genetic genealogists are beginning to reconstruct their ancestors (on paper, not in the flesh) based on the DNA that the ancestors passed on to various descendants. Those segments are “gathered up” and reassembled in a virtual ancestor. I utilized Kitty Cooper’s tool to do just that. I know it doesn’t look like much yet but this is what I’ve been able to gather of Henry Bolton, my great-great-great-grandfather. Kitty did it herself too. Ancestry.com wrote a paper about the fact that they have figured out how to do this as well in a research environment. GedMatch has created a tool called, appropriately, Lazarus that does the same thing, gathers up the DNA of your ancestor from their descendants and reassembles it into a DNA kit. Blaine Bettinger has been working with and writing about his experiences with Lazarus. Speaking of tools, we have some new tools that have been introduced this year as well. Genome Mate is a desktop tool used to organize data collected by researching DNA comparsions and aids in identifying common ancestors. I have not used this tool, but there are others who are quite satisfied. It does require Microsoft Silverlight be installed on your desktop. The Autosomal DNA Segment Analyzer is available through www.dnagedcom.com and is a tool that I have used and found very helpful. It assists you by visually grouping your matches, by chromosome, and who you match in common with. Charting Companion from Progeny Software, another tool I use, allows you to colorize and print or create pdf files that includes X chromosome groupings. This greatly facilitates seeing how the X is passed through your ancestors to you and your parents. 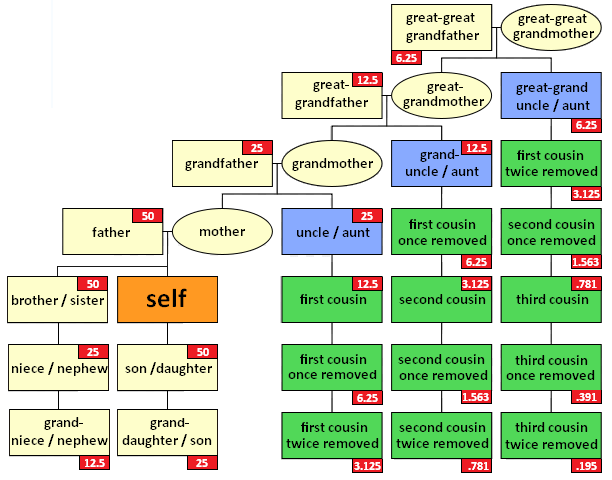 WikiTree is a free resource for genealogists to be able to sort through relationships involving pedigree charts. In November, they announced Relationship Finder. Probably the best example I can show of how WikiTree has utilized DNA is using the results of King Richard III. And then Richard’s Y, mitochondrial and X chromosome paths. Since Richard had no descendants, to see how descendants work, click on his mother, Cecily of York’s DNA descendants and you’re shown up to 10 generations. While this isn’t terribly useful for Cecily of York who lived and died in the 1400s, it would be incredibly useful for finding mitochondrial descendants of my ancestor born in 1802 in Virginia. I’d love to prove she is the daughter of a specific set of parents by comparing her DNA with that of a proven daughter of those parents! Maybe I’ll see if I can find her parents at WikiTree. Kitty Cooper’s blog talks about additional tools. I have used Kitty’s Chromosome mapping tools as discussed in ancestor reconstruction. Felix Chandrakumar has created a number of fun tools as well. Take a look. I have not used most of these tools, but there are several I’ll be playing with shortly. With very little fanfare, deCODEme discontinued their consumer testing and reminded people to download their date before year end. I find this unfortunate because at one time, deCODEme seemed like a company full of promise for genetic genealogy. They failed to take the rope and run. On a sad note, Lucas Martin who founded DNA Tribes unexpectedly passed away in the fall. DNA Tribes has been a long-time player in the ethnicity field of genetic genealogy. I have often wondered if Lucas Martin was a pseudonym, as very little information about Lucas was available, even from Lucas himself. Neither did I find an obituary. Regardless, it’s sad to see someone with whom the community has worked for years pass away. The website says that they expect to resume offering services in January 2015. I would be cautious about ordering until the structure of the new company is understood. In the last month, a new offering has become available that may be trying to piggyback on the name and feel of DNA Tribes, but I’m very hesitant to provide a link until it can be determined if this is legitimate or bogus. If it’s legitimate, I’ll be writing about it in the future. However, the big news exit was Ancestry’s exit from the Y and mtDNA testing arena. We suspected this would happen when they stopped selling kits, but we NEVER expected that they would destroy the existing data bases, especially since they maintain the Sorenson data base as part of their agreement when they obtained the Sorenson data. The community is still hopeful that Ancestry may reverse that decision. There has been an ongoing battle between Ancestry and the more seasoned or “hard-core” genetic genealogists for some time – actually for a long time. The current and most long-standing issue is the lack of a chromosome browser, or any similar tools, that will allow genealogists to actually compare and confirm that their DNA match is genuine. Ancestry maintains that we don’t need it, wouldn’t know how to use it, and that they have privacy concerns. Other than their sessions and presentations, they had remained very quiet about this and not addressed it to the community as a whole, simply saying that they were building something better, a better mousetrap. In the fall, Ancestry invited a small group of bloggers and educators to visit with them in an all-day meeting, which came to be called DNA Day. In retrospect, I think that Ancestry perceived that they were going to have a huge public relations issue on their hands when they introduced their new feature called DNA Circles and in the process, people would lose approximately 80% of their current matches. I think they were hopeful that if they could educate, or convince us, of the utility of their new phasing techniques and resulting DNA Circles feature that it would ease the pain of people’s loss in matches. I am grateful that they reached out to the community. Some very useful dialogue did occur between all participants. However, to date, nothing more has happened nor have we received any additional updates after the release of Circles. DNA Circles, while interesting and somewhat useful, is certainly NOT a replacement for a chromosome browser, nor is it a better mousetrap. In fact, the first thing you have to do when you find a DNA Circle that you have not verified utilizing raw data and/or chromosome browser tools from either 23andMe, Family Tree DNA or Gedmatch, is to talk your matches into transferring their DNA to Family Tree DNA or download to Gedmatch, or both. I might add that the great irony of finding the Hickerson DNA Circle that led me to confirm that ancestry utilizing both Family Tree DNA and GedMatch is that today, when I checked at Ancestry, the Hickerson DNA Circle is no longer listed. So, I guess I’ve been somehow pruned from the circle. I wonder if that is the same as being voted off of the island. So, word to the wise…check your circles often…they change and not always in the upwards direction. Unfortunately a seamy side, an underbelly that’s rather ugly has developed in and around the genetic genealogy industry. I guess this was to be expected with the rapid acceptance and increasing popularity of DNA testing, but it’s still very unfortunate. Some of this I expected, but I didn’t expect it to be so…well…blatant. I don’t watch late night TV, but I’m sure there are now DNA diets and DNA dating and just about anything else that could be sold with the allure of DNA attached to the title. I googled to see if this was true, and it is, although I’m not about to click on any of those links. Unfortunately, within the ever-growing genetic genealogy community a rather large rift has developed over the past couple of years. Obviously everyone can’t get along, but this goes beyond that. When someone disagrees, a group actively “stalks” the person, trying to cost them their employment, saying hate filled and untrue things and even going so far as to create a Facebook page titled “Against<personname>.” That page has now been removed, but the fact that a group in the community found it acceptable to create something like that, and their friends joined, is remarkable, to say the least. That was accompanied by death threats. Another phenomenon is that DNA is now a hot topic and is obviously “selling.” Just this week, this report was published, and it is, as best we can tell, entirely untrue. There were several tip offs, like the city (Lanford) and county (Laurens County) is not in the state where it is attributed (it’s in SC not NC), and the name of the institution is incorrect (Johns Hopkins, not John Hopkins). Additionally, if you google the name of the magazine, you’ll see that they specialize in tabloid “faux reporting.” It also reads a lot like the King Richard genuine press release. Earlier this year, there was a bogus institutional site created as well. Researchers at Aberdeen College’s Havering Centre for Genetic Research have discovered an important connection between our DNA and where our ancestors used to live. Tiny sequence variations in the human genome sometimes called Single Nucleotide Polymorphisms (SNPs) occur with varying frequency in our DNA. These have been studied for decades to understand the major migrations of large human populations. Now Aberdeen College’s Dr. Miko Laerton and a team of scientists have developed pioneering research that shows that these differences in our DNA also reveal a detailed map of where our own ancestors lived going back thousands of years. The story goes on, but at the bottom, the traditional link to the publication journal is found. The full study by Dr. Laerton and her team was published in the September issue of the Journal of Genetic Science. I thought to myself, that’s odd, I’ve never heard of any of these people or this journal, and then I clicked to find this. The picture on the masthead of the “Aberdeen College” website looks very much like a photo of Aberdeen University. This fake news item seems to be the only live page on the Aberdeen College website. If you click on any other links, including the link to the so-called “Journal of Genetic Science”, you get a message that the website is experienced “unusually high traffic”. There appears to be no such journal anyway. I still have no idea why someone would invest the time and effort into the fake website emulating the University of Aberdeen, but I’m absolutely positive that their motives were not beneficial to any of us. What is the take-away of all of this? Be aware, very aware, skeptical and vigilant. Stick with the mainstream vendors unless you realize you’re experimenting. The much anticipated and long-awaited DNA results on the remains of King Richard III became available with a very unexpected twist. While the science team feels that they have positively identified the remains as those of Richard, the Y DNA of Richard and another group of men supposed to have been descended from a common ancestor with Richard carry DNA that does not match. Debbie Kennett wrote a great summary article. One of the life lessons that genetic genealogy has held for me is that we are more closely related that we ever knew, to more people than we ever expected, and we are far more alike than different. A recent paper recently published by 23andMe scientists documents that people’s ethnicity reflect the historic events that took place in the part of the country where their ancestors lived, such as slavery, the Trail of Tears and immigration from various worldwide locations. All three groups – African Americans, European Americans and Latinos – have ancestry from Africa, Europe and the Americas. Approximately 3.5 percent of European Americans have 1 percent or more African ancestry. Many of these European Americans who describe themselves as “white” may be unaware of their African ancestry since the African ancestor may be 5-10 generations in the past. European Americans with African ancestry are found at much higher frequencies in southern states than in other parts of the US. More than 14 percent of African Americans from Oklahoma carry at least 2 percent Native American ancestry, likely reflecting the Trail of Tears migration following the Indian Removal Act of 1830. Among self-reported Latinos in the US, those from states in the southwest, especially from states bordering Mexico, have the highest levels of Native American ancestry. So what does 2015 hold? I don’t know, but I can’t wait to find out. Hopefully, it holds more ancestors, whether discovered through plain old paper research, cousin DNA testing or virtually raised from the dead! What would my wish list look like? More ancient genomes sequenced, including ones from North and South America. Ancestor reconstruction on a large scale. The haplotree becoming fleshed out and stable. Big Y sequencing combined with STR panels for enhanced genealogical research. Mitochondrial DNA search by ancestor for descendants who have tested. More tools, always more tools…. More time to use the tools! Here’s wishing you an ancestor filled 2015! This week, published in Science, we find another ancient DNA full genome sequence from Siberia in an article titled “Genomic structure in Europeans dating back at least 36,200 years” by Seguin-Orlando et al.. This sample, partially shown above, is quite old and closely related to the Mal’ta child, also found in Siberia from about 24,000 years ago. Interestingly enough, K14 carries more Neanderthal DNA than current Europeans. This skeleton was actually excavated in 1954, but was only recently genetically analyzed. From the paper, this map above shows the locations of recently analyzed ancient DNA samples. Note that even though K14 and Mal’ta child are similar, they are not located in close geographic proximity. You can see that the Neolithic samples show no trace of ancestry with today’s Native people, but both pre-Neolithic Hunter-Gatherer cultures show some amount of shared ancestry with Native people. However, to date, MA1, the Malta child is the most closely related and carries the most DNA in common with today’s Native people. Felix Chandrakumar is currently preparing the K14 genome for addition to the ancient DNA kits at GedMatch. It will be interesting to see if this sample also matches currently living individuals. Also from the K14 paper, you can see on the map below where K14 matches current worldwide and European populations, where the warmer colors, i.e. red, indicated a closer match. Of interest to genealogists and population geneticists, K14’s mitochondrial haplogroup is U2 and his Y haplogroup is C-M130, the same as LaBrana, a late Mesolithic hunter-gatherer found in northern Spain. Haplogroup C is, of course, one of the base haplogroups for the Native people of the Americas. The K14 paper further fleshes out the new peopling of Europe diagram discussed in my Peopling of Europe article. This map, from the Lazardis “Ancient human genomes suggest three ancestral populations for present-day Europeans” paper published in September 2014, shows the newly defined map including Ancient North Eurasian in this diagram. K14 adds to this diagram in the following manner, although the paths are flipped right to left. Blue represent current populations, red are ancient remains and green are ancestral populations. Dienekes wrote about this find as well, here. You can read the full paper at the two links below. It’s been a great year for ancient DNA analysis and learning about our ancestral human populations. However, I have one observation I just have to make about this particular find. What amazing teeth. Obviously, this culture did not consume sugar! One of my long standing goals has been to resurrect the lost heritage of the Native American people. By this I mean, primarily, for genealogists who search for and can’t find their Native ancestors. My blog, www.nativeheritageproject.com, is one of the ways that I contribute towards that end. Many times, records are buried, don’t exist at all, or don’t reflect anything about Native heritage. While documents can be somewhat evasive and frustratingly vague, the Y DNA of the male descendants is not. It’s rock solid. The Native communities became admixed beginning with the first visits of Europeans to what would become the Americas. Native people accepted mixed race individuals as full tribal members, based on the ethnicity of the mother. Adoption also played a key role. If a female, the mother, was an adopted white child, the mother was considered to be fully Native, as was her child, regardless of the ethnicity of the father. Therefore, some people who test their DNA expecting to find Native genetics do not – they instead find European or African – but that alone does not mean that their ancestors were not tribal members. It means that these individuals have to rely on non-genetic records to prove their ancestors Native heritage – or they need to test a different line – like the descendants of the mother, through all females, for example, for mitochondrial DNA. On the other hand, some people are quite surprised when their DNA results come back as Native. Many have heard a vague story, but often, they don’t have a clue as to which genealogical line, if any, the Native ancestry originated. Native ancestry was often hidden because the laws that prevailed at the time sanctioned discrimination of many kinds against people “of color,” and if you weren’t entirely of European origin, you were “of color.” Many admixed people, as soon as they could, “became” white socially and never looked back. Not until recently, the late 20th century, when discrimination had for the most part become a thing of the past and one could embrace their Native or African heritage without fear of legal or social reprisal. Back in December of 2010, we found the defining SNP that divided haplogroup Q between Europeans and Native Americans. At the time, this was a huge step forward, a collaboration between testing participants, haplogroup administrators, citizen scientists and Family Tree DNA. This allowed us to determine who was, and was not included in Native American haplogroups, but it was also the tip of the iceberg. You can see below just how much the tree has expanded and its branches have been shuffled. This is a big part of the reason for the change from haplogroup names like Q1a3 to Q-M346. For example, at one time or another the SNP M3 was associated with haplogroup names Q1a3a, Q1a3a1 and Q1a3a1a. On the ISOGG tree below, today M3 is associated with Q1a2a1a1. The new Family Tree DNA 2014 tree is shown below for one of the Big Y participants whose terminal SNP is L568, found beneath SNP CTS1780 which is found beneath L4, which is beneath L213 which is beneath L474 which is beneath MEH2 which is beneath L232 which is, finally, beneath M242. The introduction of the Big Y product from Family Tree DNA, which sequences a large portion of the Y chromosome, provided us with the opportunity to make huge strides in unraveling and deciphering the haplogroup Q (and C, the other male Native haplogroup in the Americas) tree. I am hopeful that in time, and with enough people taking the Big Y test, that we will one day be able to at least sort participants into language and perhaps migration groups. In November, 2013, we asked for the public and testers to support our call for funds to be able to order several Big Y tests. The project administrators intentionally did not order tests in family groups, but attempted to scatter the tests to the far corners, so to speak, and to include at least one person from each disparate group we have in the haplogroup Q project, based on STR matches, or lack thereof, and previous SNP testing. Thanks to the generosity of contributors, we were able to order several tests. In addition, some participants were able to order their own tests, and did. Thank you one and all. The tests are back now, and with the new Big Y SNP matching, recently introduced by Family Tree DNA, comparisons are a LOT easier. So, of course, I had to see what I could find by comparing the SNP results of the several gentlemen who tested. To protect the privacy of everyone involved, I have reduced their names to initials. I have included their terminal SNP as identified at Family Tree DNA as well as any tribal, ethnic or location information we have available for their most distant paternal ancestor. There are two individuals who believe their ancestors are from Europe, and there is a very large group of European haplogroup Q members, but I’m not convinced that the actual biological ancestors of these two gentlemen are from Europe. I have included both of these individuals as well. Let’s just say the jury is still out. As a control, I have also included a gentleman who actually lives in Poland. Of the individuals above, SD, CT and CM are SNP matches. CD, WJS and WBS are SNP matches with each other. BG and ETW are also SNP matches to each other. In the table above, the Non-Matching Known SNPs are shown with the number of Shared Novel Variants. For example, SD and CT have 4 non-matching SNPS and share 161 Novel Variants and are noted as 4/161. We can easily tell which of the known SNPs are nonmatching, because they are shown on the participants match page. What we don’t know, and can’t tell, is how many Novel Variants these people share with each other, and how many they might share with the individuals that aren’t shown as matches. Keep in mind that there may be individuals here that are not shown as matches to due no-calls. Only people with up to and including 4 non-matching Known SNPs are counted as matches. If you have the wrong combination of no-calls, or, aren’t in the same terminal haplogroup, you may not be shown as a match when you otherwise would be. The other reason for my intense interest in the Novel Variants is to see if they are actually Novel, as in found only in a few people, or if they are more widespread. I downloaded each person’s Novel Variants through the Export Utility (blue button to the right at the top of your personal page,) and combined the Novel Variants into a single spreadsheet. I colorized each person’s result rows so that they would be easy to track. I have redacted their names. The white row, below, is the individual who lives in Poland. There are a total of 3506 Novel Variants between these men. When sorting, many clustered as you would expect. There is the Algonguian group and what I’ve taken to calling the Borderlands group. This group has someone whose ancestor was born in VA and two in SC. I have documentation for the Virginia family having descendants in SC, so that makes sense. The third group is an unusual combination of the gentleman who believes his ancestors are from Germany and the gentleman whose ancestors are found in a New Mexico Pueblo tribe, but whose ancestor was, likely, based on church records, a detribalized Plains Indian who had been kidnapped and sold. Clusters that I felt needed some scrutiny, for one reason or another, I highlighted in yellow in the Terminal SNP column. Obviously the Polish/Pueblo matching needs some attention. Another very interesting type of match are several where either all or nearly all of the individuals share a Novel Variant – 15 or 16 of 16 total participants. I don’t think these will remain Novel Variants very long. They clearly need to be classified as SNPs. I’m not sure about the process that Family Tree DNA will use to do this, but I’ll be finding out shortly. Here’s an example where everyone shares this Novel Variant at location 7688075,except the gentleman who lives in Poland, the man who believes his ancestor is from Germany, and the Creek descendant. I was very surprised at how many Novel Variants appear in all 16 results of the participants, including the gentleman who lives in Poland – represented by the white row below. So, how were the Novel Variants distributed? Algonquian Group 140 This is to be expected since it’s within a specific group. Any matches that include people outside the 3 Algonquian individuals are counted in a separate category. These matches give us the ability to classify anyone who tests with these marker results as provisionally Algonquian. Borderlands 83 This confirms that these three individuals are indeed a “group” of some sort. This also gives us the ability to classify future participants using these mutations. All or Nearly All – 15 or 16 Participants 80 These are clearly candidates for SNPs, and, given that they are found in the Native and the European groups, they appear to predate the division of haplogroup Q. Several Native and European, Combined 45 This may or may not include the person who lives in Poland. This group needs additional scrutiny to determine if it actually does exist in Europe, but given that there are more than 3 individuals with each of these Novel Variants, they need to be considered for SNPhood. German/Pueblo 9 I wonder if this person is actually German. Poland/Mexico 20 I wonder if this person’s ancestors are actually from Poland. Some of this distribution makes me question if these SNP mutations truly are a “once in the history of mankind” kind of thing. For example, how did the same SNP appear in the Polish person and the NC person, or the Pueblo person, and not in the rest of the Native people? Based on these numbers, it looks like we have at least 125 new SNP candidates for haplogroup Q. If we count the Algonquian and the Borderlands groups of matches, that number rises to about 250. This is very exciting. Far, far more than I ever expected. of these SNPS, about half will identify Native people, even Native groupings of people. This is a huge step forward, a red letter day for Native American ancestry! Lastly, I wanted to see how the SNP matching compared to STR matching, or if it did at all, for these men. Only two men match each other on any STR markers. CD and WJS matched on 12 markers, but not on higher panels. The TIP calculator estimated their common ancestor at the 50th percentile to be 17 generations, or between 425 and 510 years ago. We all know how unrealistic it is to depend on the TIP calculator, but it’s the only tool we have in situations like this. Given that these are the only two men who do match on STR markers, albeit distantly, in a genealogical timeframe, let’s see what the estimates using the 150 years per SNP mutation comes up with. This estimate is just that, devised by the haplogroup R-U106 project administrators, and others, based on their project findings. 150 years is actually the high end of the estimate, 98 being the lower end. Of course, different haplogroups may vary and these results are very early. Just saying. CD has 207 high quality Novel Variants. He shares 188 of those with WJS, leaving 19 unshared Novel Variants. Utilizing this number, and multiplying by 150, this suggests that, if the 150 years per SNP is anyplace close to accurate, their common ancestor lived about 2850 years ago. If you presume that both men are incurring mutations at the same rate in their independent lines, then you would divide the number of years in half, so the common ancestor would be more likely 1425 years ago. If you use 100 years instead of 150, the higher number of years is 1900 and the half number is about 950 years. It’s fun to speculate a bit, but until a lot more study has occurred, we won’t be able to reasonably estimate SNP age or age to common ancestor from this information. Having said all of that, it’s not a long stretch from 710 years to 950 years. It looks like STR markers are still the way to go for genealogical matching and that SNPS may help to pull together the deeper ancestry, migration patterns and perhaps define family lines. I hope the day comes soon that I can order the Big Y for lots more project members. Most of these men do have STR marker matches, and to men with both the same and different surnames. I’d love to see the Big Y results for those individuals who match more closely in time. This is still the tip of the iceberg. There is a lot left to discover! If you or a family member have haplogroup Q results, please consider ordering the Big Y. It would make a wonderful gift and a great way to honor your ancestors! Something is wrong with the X chromosome. More specifically, something is amiss with trying to use it, the way we normally use recombinant chromosomes for genealogy. In short, there’s a problem. If you don’t understand how the X chromosome recombines and is passed from generation to generation, now would be a good time to read my article, “X Marks the Spot” about how this works. You’ll need this basic information to understand what I’m about to discuss. As a genetic genealogist, at the time Jim wrote this piece, I was most interested in the fact that he had phased or attributed the pieces of the X to specific ancestors and the process he used to do that. I found the very skewed inheritance “interesting” but basically attributed it to an anomaly. It now appears that this is not an anomaly. It was, instead the tip of the iceberg and we didn’t recognize it as such. Let’s look at what we would normally expect. The X chromosome does recombine when it can, or at least has the capacity to do so. This means that a female who receives an X from both her father and mother receives a recombined X from her mother, but receives an X that is not recombined from her father. That is because her father only receives one X, from his mother, so he has nothing to recombine with. In the mother, the X recombines “in the normal way” meaning that parts of both her mother’s and her father’s X are given to her children, or at least that opportunity exists. If you’re beginning to see some “weasel words” here or “hedge betting,” that’s because we’ve discovered that things aren’t always what they seem or could be. In the statistical world of DNA, on the average, we believe that each generation receives roughly half of the DNA of the generations before them. We know that each child absolutely receives 50% of the DNA of both parents, but how the grandparents DNA is divided up into that 50% that goes to each offspring differs. It may not be 50%. I am in the process of doing a generational inheritance study, which I will publish soon, which discusses this as a whole. However, let’s use the 50% rule here, because it’s all we have and it’s what we’ve been working with forever. 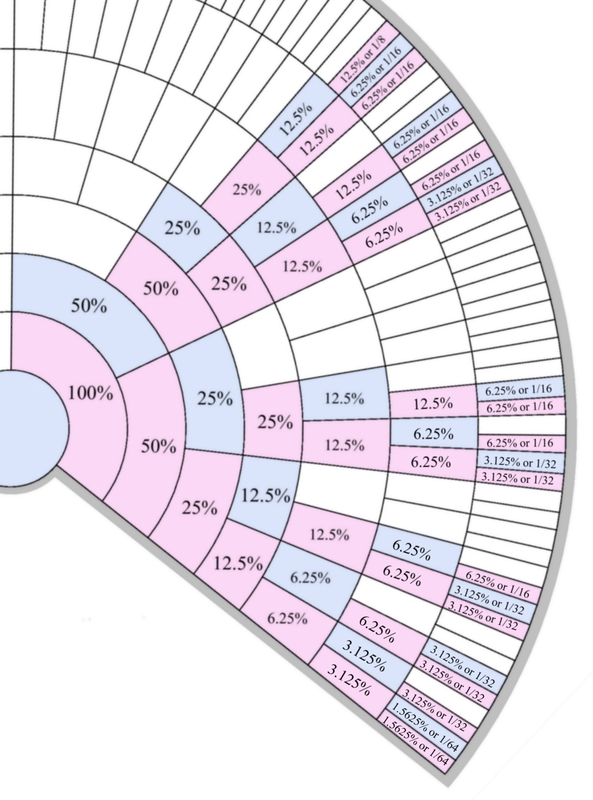 Please note Blaine Bettinger’s X maternal inheritance chart percentages from his “More X-Chromosome Charts” article, and used with his kind permission in the X Marks the Spot article. I’m enlarging the inheritance percentage portion so you can see it better. Taking a look at these percentages, it becomes evident that we cannot utilize the normal predictive methods of saying that if we share a certain percentage of DNA with an individual, then we are most likely a specific relationship. This is because the percentage of X chromosome inherited varies based on the inheritance path, since men don’t receive an X from their fathers. Not only does this mean that you receive no X from many ancestors, you receive a different percentage of the X from your maternal grandmother, 25%, because your mother inherited an X from both of her parents, versus from your paternal grandmother, 50%, because your father inherited an X from only his mother. 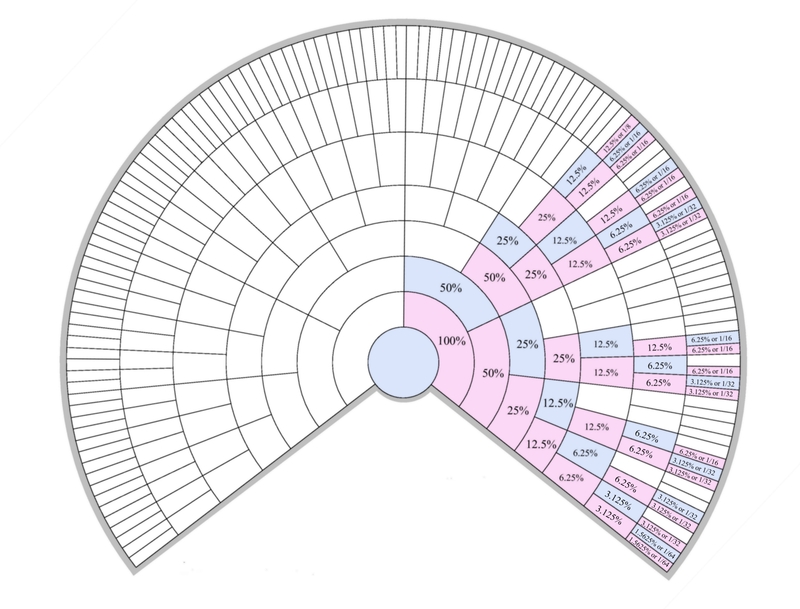 The Genetic Kinship chart, below, from the ISOGG wiki, is the “Bible” that we use in terms of estimating relationships. 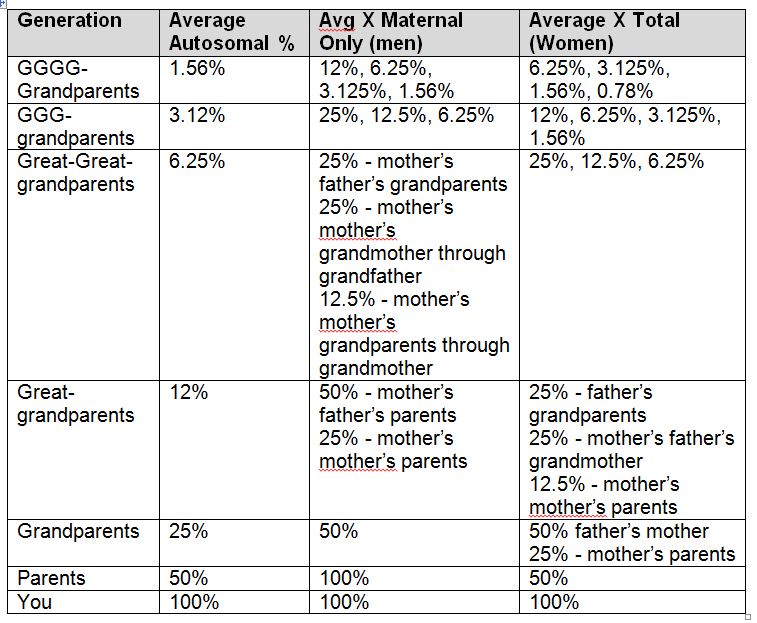 It doesn’t work for the X.
Let’s look at the normal autosomal inheritance model as compared to the maternal X chart fan chart percentages, above, and similar calculations for the paternal side. Remember, the Maternal Only column applies only to men, because in the very first generation, men’s and women’s inheritance percentages diverge. Men receive 100% of their X from their mothers, while women receive 50% from each parent. The genetic genealogy community has been hounding Family Tree DNA incessantly to add the X chromosome matching into their Family Finder matching calculations. On January 2, 2014, they did exactly that. What’s that old saying, “Be careful what you ask for….” Well, we got it, but “it” doesn’t seem to be providing us with exactly what we expected. First, there were many reports of women having many more matches than men. That’s to be expected at some level because women have so many more ancestors in the “mix,” especially when matching other women. Family Tree DNA does not use the X exclusively for matching. This means that if you match someone utilizing their normal autosomal matching criteria of approximately 7.7cM and 500 SNPs, and you match them on the X chromosome, they will report your X as matching. If you don’t match someone on any chromosome except the X, you will not be reported as a match. However, matching isn’t all of the story. The X appears to not recombine normally. By normally, I don’t mean something is medically wrong, I mean that it’s not what we are expecting to see in terms of the 50% rule. In essence, we would expect to see approximately half of the X of each parent, grandfather and grandmother, passed on to the child from the mother in the maternal line where recombination is a possibility. That appears to not be happening reliably. Not only is this not happening in the nice neat 50% number, the X chromosome seems to be often not recombining at all. If you think the percentages in the chart above threw a monkey wrench into genetic genealogy predictions, this information, if it holds up in a much larger test, in essence throws our predictive capability, at least as we know it today, out the window. In my generational study, I noticed that the X seemed not to be recombining. Then I remembered something that Matt Dexter said at the Family Tree DNA Conference in November 2013 in Houston. Matt has the benefit of having a full 3 generation pedigree chart where everyone has been tested, and he has 5 children, so he can clearly see who got the DNA from which of their grandparents. I contacted Matt, and he provided me with his X chromosomal information about his family, giving me permission to share it with you. I have taken the liberty of reformatting it in a spreadsheet so that we can view various aspects of this data. First, note that I have sorted these by grandchild. There are two females, who have the opportunity to inherit from 3 grandparents. The females inherited one copy of the X from their mother, who had two copies herself, and one copy of the X from her father who only had his mother’s copy. Therefore, the paternal grandfather is listed above, but with the note “cannot inherit.” This distinguishes this event from the circumstance with Grandson 1 where he could inherit some part of his maternal grandfather’s X, but did not. For the three grandsons, I have listed all 4 grandparents and noted the paternal grandmother and grandfather as “cannot inherit.” This is of course because the grandsons don’t inherit an X from their father. Instead they inherit the Y, which is what makes them male. According to the Rule of 50%, each child should receive approximately half of the DNA of each maternal grandparent that they can inherit from. I added the columns, % Inherited cM and % Inherited SNP to illustrate whether or not this number comes close to the 50% we would expect. The child MUST have a complete X chromosome which is comprised of 18092 SNPs and is 195.93cM in length, barring anomalies like read errors and such, which do periodically occur. 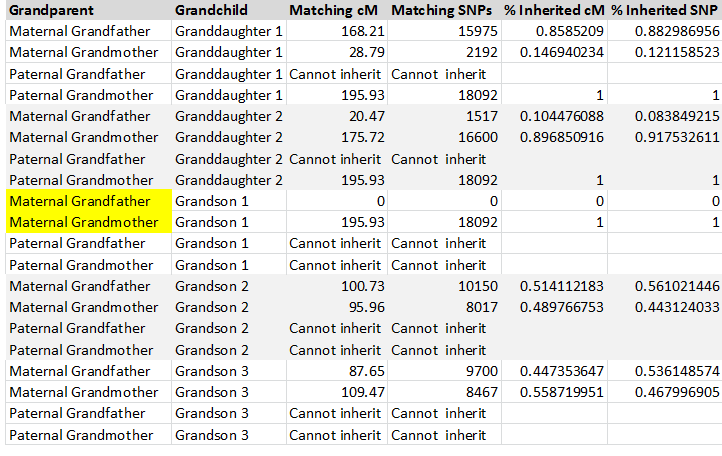 In these columns, 1=100%, so in the Granddaughter 1 column of % Inherited cM, we see 85% for the maternal grandfather and about 15% for the maternal grandmother. That is hardly 50-50, and worse yet, it’s no place close to 50%. Granddaughter 1 and 2 must inherit their paternal grandmother’s X intact, because there is nothing to recombine with. Granddaughter 2 inherited even more unevenly, with about 90% and 10%, but in favor of the other grandparent. So, statistically speaking, it’s about 50% for each grandparent between the two grandchildren, but it is widely variant when looking at them individually. Grandson 1, as mentioned, inherited his entire X from his maternal grandmother with absolutely no recombination. Grandsons 2 and 3 fall much closer to the expected 50%. The problem for most of us is that you need 3 or 4 consecutive generations to really see this happening, and most of us simply don’t have data that deep or robust. A recent discussion on the DNA Genealogy Rootsweb mailing list revealed several more of these documented occurrences, among them, two separate examples where the X chromosome was unrecombined for 4 generations. One woman’s X matches her great-great-grandmother’s X exactly. That’s 4 separate inheritance events in a row where the X was not recombined at all. The graphic below, provided by Robert, shows the chromosome browser at 23andMe where you can see the X matches exactly for all three participants being compared. The screen shot is of the gg-granddaughter Evelyn being compared to her gg-grandmother, Shevy, Evelyn’s g-grandfather Rich and Evelyn’s grandmother Cyndi. 23andme only lets you compare 3 individuals at a time so Robert did not include Evelyn’s mother Shay, who is an exact match with Evelyn. So what does this mean to genetic genealogy? It certainly does not mean we should throw the baby out with the bath water. 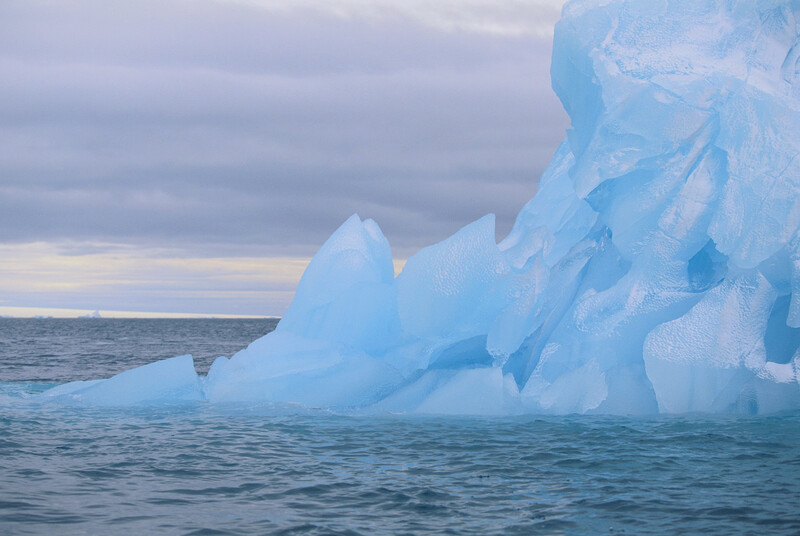 What it is, is an iceberg warning that there is more lurking beneath the surface. What and how big? I can’t tell you. I simply don’t know. The X chromosome matching can tell you that you do share a common ancestor someplace back in time. The amount of DNA shared is not a reliable predictor of how long ago you shared that ancestor. The amount of DNA shared cannot predict your relationship with your match. In fact, even a very large match can be many generations removed. The absence of an X match, even with someone closely related whom you should match does not disprove a descendant relationship/common ancestor. The X appears to not recombine at a higher rate than previously thought, the previous expectation being that this would almost never happen. The X, when it does recombine appears to do so in a manner not governed by the 50% rule. In fact, the 50% rule may not apply at all except as an average in large population studies, but may well be entirely irrelevant or even misleading to the understanding of X chromosome inheritance in genetic genealogy. The X is still useful to genetic genealogists, just not in the same way that other autosomal data is utilized. The X is more of an auxiliary chromosome that can provide information in addition to your other matches because of its unique inheritance pattern. Unfortunately, this discovery leaves us with more questions than answers. I found it incomprehensible that this phenomenon has never been studied in humans, or in animals, for that matter, at least not that I could find. What few references I did find indicated that the X seems to recombine with the same frequency as the other autosomes, which we are finding to be untrue. What is needed is a comprehensive study of hundreds of X transmission events at least 3 generations deep. As it turns out, we’re not the only ones confused by the behavior of the X chromosome. Just yesterday, the New York Times had an article about Seeing the X Chromosome in a New Light. It seems that either one copy of the X, or the other, is disabled cell by cell in the human body. If you are interested in this aspect of science, it’s a very interesting read. Indeed, our DNA continues to both amaze and amuse us. A special thank you to Jim Owston, Matt Dexter, Blaine Bettinger and Robert Paine for sharing their information. When I first started doing genealogy, I didn’t even realize “it” had a name, or that I was doing “it.” I am truly the accidental genealogist. I simply wanted to find out something about my father’s family. He died in a car accident when I was in grade school and we didn’t live anyplace close to his family. I think the nesting instinct had set in. I was pregnant for my second child. I did discover some information, but that ended with the memory of older family members. And then, my genealogy endeavors took a decade long holiday while I finished my master’s degree and other life events happened. One day, I saw an announcement in the newspaper that the local Mormon Church was having a genealogy workshop. They invited you to bring your sticky problem and come on by. I took that same child with me that evening, somewhat apprehensive about the session being a “trap” to get folks into the church. The Mormon people never use genealogy as a way to entrap non-Mormons – so no worry there. As genealogists have discovered, one discovery leads to two at least more questions. I was hooked that night at the Mormon church. We found the marriage record of my Lazarus Estes and Elizabeth Vannoy on microfiche. I still remember the awe and thrill of that moment, looking at that scratchy old record. Anyone who asks when you’re going to be finished with your genealogy just doesn’t understand the blank noncomprehending stare they receive in reply. What I expected to find, after my initial foray to find some living relatives, was history. I didn’t expect to find a lifelong obsession. And I had no idea I’d find other, more distant family, that I would become very close to. My cousin Daryl comes to mind. We met over the internet researching a common family line a decade ago. She has become my sister-of-heart and my travel companion. In fact, here’s a photo we took, trapped inside a cemetery in Tennessee. 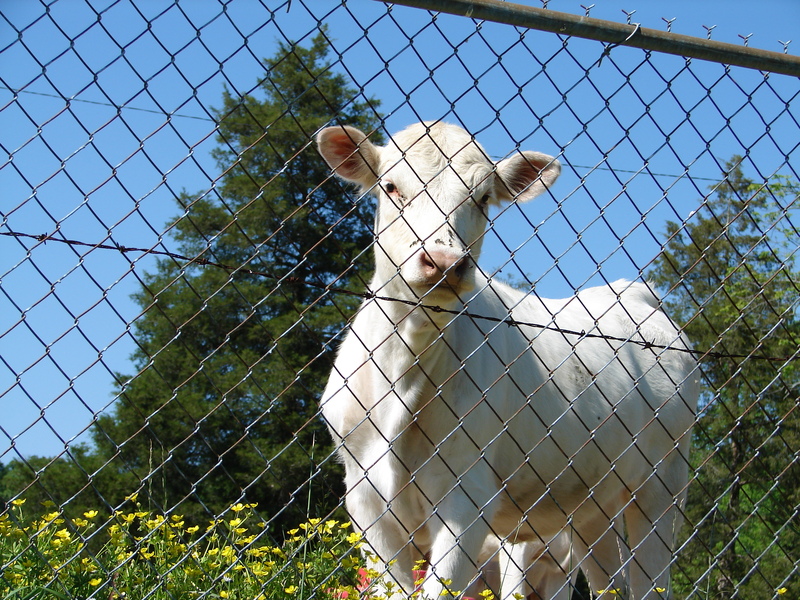 Thankfully, it WAS fenced and the fence was between us and the bull, even if we were trapped inside. I’m still not sure if that bull was unhappy with our presence in HIS field or hopeful of adding us to his harem. Yep, these are things you only do with very close friends or family! And what great memories we’ve made. I was thinking this morning about how genealogy has changed. For years, we wrote letters. Remember watching for the mailman to arrive and running to the mailbox? I surely do, especially when you had written someplace for a record and were expecting its arrival. All genealogists knew exactly what time the mail was supposed to arrive! As time evolved, the advent of e-mail has been a huge boon to genealogy. Now, we very seldom write letters and we interact in the space of minutes or hours with new and old cousins. I’ve also stopped trying to quantify “cousin.” If we’re related and not a parent/sibling aunt/uncle niece/nephew, then we’re “cousins,” kin, and that’s all that matters. With the advent of DNA testing, I’ve discovered I’m “cousin” to more people than I’m not! My, how the world has both grown and shrank in one fell swoop. I am so very blessed to have so many genealogically discovered cousins, here, as well as many who live in other countries – Marja in Finland who I met in November, David in Australia, Doug in New Zealand who I met up with in England, John in Japan, Yvette in the Netherlands who I’ll meet this year, and the list goes on. So, now I’m curious about your experiences with both genealogy and genetic genealogy. Aside from the answers to historical questions, has genealogy or genetic genealogy enhanced your life by adding people to your list of family that you care about? Has it changed your life? If so, how? You can answer the polls below, or leave comments, or both. You may have seen the headlines and the announcement this week by Illumina, manufacturer of gene sequencing equipment, that the $1000 genome is finally here. Hallelujah – jump for joy – right? Sign me up – where can I order??? It’s a great headline – and depending on how you figure the math – it’s not entirely untrue, but it’s a real struggle to get there. Some marketing maven did some real spreadsheet magic! What is that old saying, “lies, damned lies and statistics”? Maybe that’s a little harsh, but it’s not too far off. So, is the $1000 genome here or not? Well, kindof. It depends on how you count, and who you are. You see, it’s a math thing. So, let’s translate this to the $1000 genome. Dr. David Mittleman, Chief Scientific Officer for Gene by Gene, Ltd., parent company of Family Tree DNA, was at the conference this week where the Illumina announcement was made. I asked him several questions about this new technology and if it was ready for prime time yet. His first comment shed some light on costs. Ouch. I guess I won’t be buying one anytime soon! To begin with, without the cost of the kits or processing or staff or software or installation or financing or support contracts or profit, a company would have to sell 10,000 kits at $1000 to even bring the cost of the equipment to $1000 per kit. 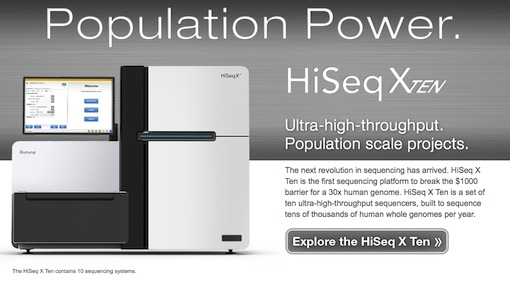 So, how did Illumina figure the cost of the $1000 genome? The $1000 is broken down as $800 on reagents, $135 on equipment depreciation over 4 years, and $65 on staff/overheads. This means that to obtain that $1000 per genome price, you have to run the equipment at full capacity, 24X7, 18,000 kits per year, for 4 full years. And that still doesn’t include everything. You also need service contracts, installation, additional labor, etc. You can read more about the math and cost of ownership here. And sure enough, when I asked David about who has purchased one so far, there are two buyers and both are institutions. This is an extremely high end product, not something for the DTC consumer marketspace. Now this isn’t to say this announcement is a bad thing – it’s not – it’s just not exactly what the headlines suggest. It’s the $1000 genome for those with deep pockets who can purchase a $10,000,000 piece of gear and then run 18,000 samples, for 4 years, plus expenses. But yes, it does technically break down to $1000 per test as long as you hit all of those milestones and ignore the rest of the expenses. If you can afford $10 million and have the staff to run it, you probably don’t care about the cost of installation, labor and support contracts. They are just necessary incidentals – like gas for my lawn mower! In spite of the fancy math, it’s truly amazing how far we’ve come when you consider that a single full genome sequence still cost about 3 million in 2007, and in November 2012 Gene by Gene was the first to offer full sequencing commercially and offered it to their customers for an introductory price of $5495. Of course, with no analysis tools and few testers, I can’t imagine what one would do with those results. This has changed somewhat today. The full genome with some analysis is available today to consumers for $7595, but the question of what is available that is genealogically useful to do with these results still remains, and will, until many more people test and meaningful comparisons are available. The Illumina announcement also raises the issue of software investment to do something useful with the massive amount of data this new equipment will generate…also nontrivial, and that software does not exist yet today. There are other issues to be addressed as well, like open access libraries. Will they exist? If so, where? Who cares for them? How are they funded? Who will have access? Will this data be made available in open access libraries, assuming they exist? Illumina has reported that entire countries have approached them asking for their population to be sequenced, which also begs questions of privacy, security and how exactly to anonymize the samples without them becoming useless to research. This high tech watershed announcement may spur as many questions as answers, but these issues need to be resolved in the academic environment before they trickle down to the consumer marketspace. This is not to minimize the science and technology that has propelled us to this breakthrough. It is a wonderful scientific and technological advancement because it will allow governments or large institutes to do huge population-wide studies. This is something we desperately need. Think for a minute if our Population Finder ethnicity results were based on tens of thousands of samples instead of selected hundreds. For genetic genealogists, we are poised to benefit in the future, probably the more distant than the near future. The $1000 genome for consumers not only isn’t here, it’s not even within sniffing distance. So put your checkbooks away or better yet, buy a Big Y or a Family Finder test for a cousin, something that will benefit you in the short term. This next step in the world of genetic discovery is exciting for research institutes, but it’s not yet ready for consumer prime time. We will be the beneficiaries, but not the direct consumers….yet…unless you want to move to one of those countries who wants their entire population sequenced. Our turn will come. Maybe the next time we see an announcement for the $1000 genome it will be calculated in normal home-owning-human terms. If you’d like to see the product announcement and a cool video that Illumina created, take a look here. The video is short and provides a neat way to look at genetic history.